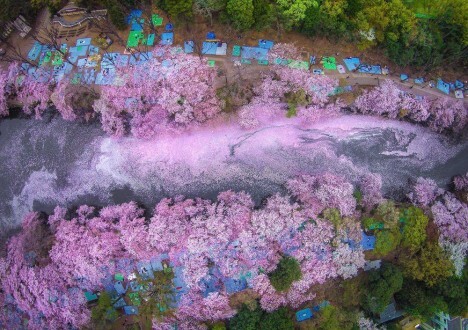 Blooming cherry trees are a sight to behold from the ground, but seen from the sky above they become a kind of eighth wonder of the world, turning everything around them into a glorious violet. 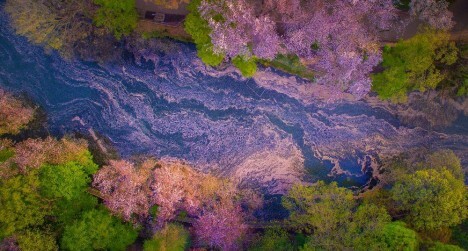 Photographer Danilo Dungo took these pictures at Inokashira Park in Tokyo, a place famous for its abundant annual blooms, as part of an annual photographic tradition. 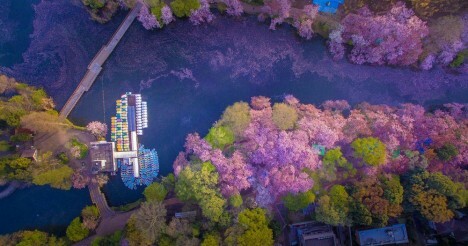 The Tokyo-based photographer has taken to shooting the scene not just from among the trees but also via aerial drone, capturing not just the flowers on branches but also the way they flood the lake below. 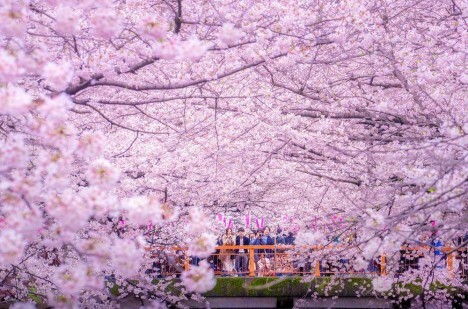 Hanami (literally “flower viewing”) is the Japanese traditional custom of enjoying the transient beauty of flowers, almost always referring to those of the cherry (“sakura”) or, less frequently, plum (“ume”) trees. From the end of March to early May, sakura bloom all over Japan, and around the first of February on the island of Okinawa. 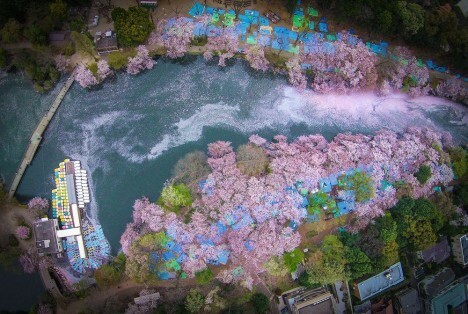 The blossom forecast is announced each year by the weather bureau, and is watched carefully by those planning hanami as the blossoms only last a week or two. Other cultures could learn a thing or too from this deep appreciation of nature’s fleeting wonders. See more in Earth & Nature or under Science. June, 2016.